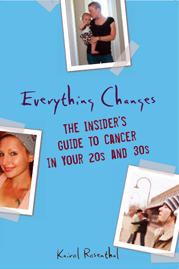 Everything Changes – The Guide to Young Adult Cancer » Grey’s Anatomy: Fact or Fiction? Grey’s Anatomy: Fact or Fiction? Disclaimer: I live under a rock, don’t own a TV, and have never read a print copy of USA Today. I’m pretty okay with all three statements. 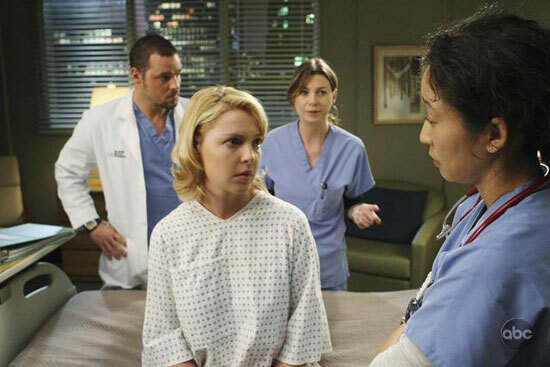 Kudos to Grey’s Anatomy for: showing young adult cancer along with family and fertility issues, illustrating melanoma as a serious deadly disease, and revealing that advanced cancers do not have a quick fix solutions but involve super challenging choices between two evils with no guarantee for favorable results… if you are lucky. But, damn Grey’s for not getting it right. An article in USA Today says Izzie’s options not accurate: surgery, with memory loss as a side effect, or interleukin-2. American Cancer Society confirmed that IL-2 is never recommended for melanoma brain mets because it can cause bleeding and strokes. Grey’s consults with MDs, so why can’t they get it right? Are they just dialing up the drama on the storyline? I’ve been living with cancer for nine years and there is plenty of drama to go around with my story just from the very accurate and real life details. Does Grey’s do more harm than good with this storyline? Good: It spurs discussion and awareness. This article highlights one of my all time favorite orgs, Planet Cancer, and quotes JT, one of the most amazing people I’ve ever met. Do you watch Grey’s? Does the storyline do more harm than good? What does it say that instead of covering healthcare policy, a major American newspaper is covering the TV coverage of a fictional cancer patient? And have I just lowered my standards by blogging about a USA Today article? Oh medical dramas…. Way back when I was dating a resident on his few nights off or hours off, I would medical dramas with all the internists in training. It ruined my TV watching as medical shows have very little basis in reality. From diseases to adminstration errors (like 8 year residents) the doctors left no error unnamed. One would think in ten years things would change. I read an article a few months back where Italy was considering banning medical dramas because they spread so much false information that they did more harm than good. Patients expect too much and doctors can never perform like those on TV. As for Izzie, it is good to have a young cancer rep on TV, like Pedro on MTV’s Real World giving a face to AIDS. Other than that I see little benefit. Once the show is over people go on with their lives. I watch Grey’s (but I don’t read USA Today, does that save me?) and I have to say – I think the whole story line with Izzy is just that. It’s a TV Drama. The fact that it’s a popular show and so many viewers now saw young adults with cancer. It will bring awareness. If people get medical advice from a company called “ShondaLand” then they have issues. In fact, those of us who deal with huge health issues are accustomed to not taking our Medical Professionals at their word. I questioned all my doctors and continue to do my own research on my condition. Why expect network TV to get it right? At the very least, people are talking about young adults with cancer. More important than the accuracy of the medicine, the portrayal of Izzie struggling with options, with a parent who can’t deal, and fertility issues does shed light on the young adult cancer experience. They show the chemo room with many young people and Izzie finds a fellow young adult survivor friend. While that is most likely not the typical demographic of a chemo room on any given day, at least it says to the world “Hey- young people get cancer!! !” And the sad reality is that more people will be moved and take to heart an article about a fictional tv character than if the article was about you or me. So, no, I don’t think you lowered your standards by blogging this! I have only seen one episode of Grey’s. I don’t do medical drama’s well. I do think though that it is good to have this storyline with Izzie as it brings a face and gives a louder voice to YA cancer with its unique issues. Having said that though I do think that accuracy is important. I say that because with television such a huge part of some people’s lives for some it may be there only exposure to YA cancer. I think it can effect the public’s perception and expectations. I worked for many years on a Head Trauma Unit with many young teens injured in car accidents left in a coma. For the parents, all they knew was what they saw on TV. You know, the coma patient that miraculously wakes up and says a groggy “Hi” to the family surrounding their bed. For the majority of patients I worked with it was so not the case. But try explaining that to the family when they accepted what they saw on TV fiction or not as the truth. I cannot watch medical TV – even the so-called documentaries. They are both illusions and far too real for those of us that have been there. I cannot see emergency room drama without recalling my own rapid transit past dozens of people when my surgeon thought that my anastomosis had burst. The acute pain was too much, and the memory is still too vivid. The hospital room that I inhabited for far too long still feels real to me, and the dramatics of the TV drama hospital rooms too pretend, to want to watch any part of that. Great post. You do not demean yourself or us by seeking (and commenting on) popular information media that you use. Thank you for taking the trouble!